Home > WIRELESS 3D SHUTTER THEATER FOR TWO! Movie makers have been experimenting with 3D video for a long time. 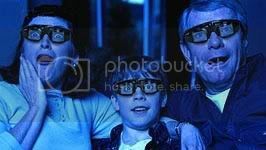 Up until now the standard method for viewing 3D was the old-fashioned blue and red cellophane and paper glasses. With the new technology of this 3D Home Theater, the paper glasses have been replaced by a revolutionary 3D Video Viewing System. When you view 3D content using our patented 3D glasses, the left and right images are seen clearly, one eye at a time. The way that this is achieved is by rapidly alternating the opening and closing of an LCD (liquid crystal display) lens in front of each eye. While your right eye sees the right image, the left eye is blocked by a darkened LCD lens (or shutter) and vice versa, back and forth. This alternating of images occurs many times a second and your brain fuses these separate images into one Truly 3-Dimensional image. The speed of the shutters is set in direct proportion to the refresh rate of your TV. The wired 3D glasses remain in-sync with the image source via a connecting wire to the control box. The wireless 3D glasses accomplish this by receiving an infared signal from the control box. Because the 3D Video Viewing System does not use blue and red colored lenses the picture is very clear and there is no distortion of the movie's color. If you have ever been amazed by a wide-screen 3D movie, the holographic visuals of the 3D Video Viewing System will astound you! Are you looking for a unique gift item for your family? Treat your senses to the most powerful and involving movie experiences ever created. Step into the pilot seat and enter a world beyond imagination. The images are so real, they take on a whole new dimension as the action comes right off the screen and the 3D effects surround you! Step into your TV... the world opens up. The 3D Video Viewing System places you in the heart of the action. Experience incredible eye-popping 3D! You'll enjoy hours of great entertainment with our 3D titles: Nature, Travel, Sports, Adventure, Horror and more! The 3D Theater is easy to set up: The video transmitter and wired glasses easily connect between your TV and VHS video player, DVD player or other source so you can view the DVDs listed in our Ebay Store (To Include IMAX and MANY MORE) and most other 3D videos and DVDs. Images take on a whole new dimension! Please Note: CRT or �Tube� type regular televisions are highly recommended for use with the 3D Video Viewing Systems. These types of televisions refresh their image in a very consistent manner, which makes it very easy for the 3D system to synchronize to the signal. So if you have a regular television read no further and press buy it now for an amazing 3D experience!